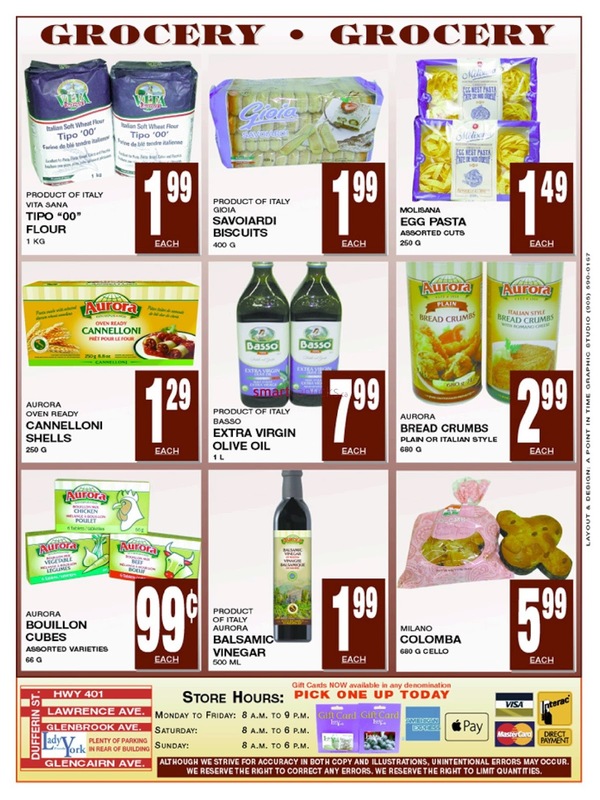 Lady York Foods Canada Flyer March 26 - 31, 2018 - PRODUCT OF ITALY VITA SAMNA TIPO '00" FLOUR 1 KG 1.99 each. AURORA OVEN READY CANNELLONI SHELLS 250 g 1.29 EACH. PRODUCT OF ITALY GIOIA SAVOIARDI BISCUITS 400 G 1.99 each. 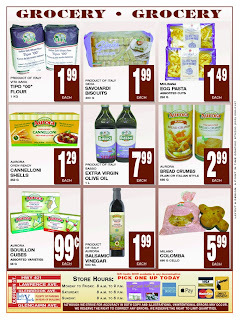 PRODUCT OF ITALY BASSO EXTRA VIRGIN OLIVE OIL 1 L 7.99 EACH. Lady York Foods Canada Flyer MOLISANA EGG PASTA ASSORTED CUTS 250 g 1.49 ea. AURORA BREAD CRUMBS MAIN OR ITALIAN STYLE 680 g 2.99 EACH. AURORA BOUILLON CUBES ASSORTED VARIETIES 66 G 99 c EACH. PRODUCT OF ITALY AURORA BALSAM I VINEGAR 500 ML 1.99 EACH. MILANO COLOM BA GS0 G CELLO 5.99 EACH. Product Of Costa Rica JUMBO DEL MONTE CANTALOUPES 2.49 ea. Product of South Africa BARTLETT PEARS 1.49 LB / 3.28 KG. Product of Mexico ROMA TOMATOES 1.49 lb / 3.28 kg. Product of USA. LARGE RED, WHITE OR YUKON GOLD POTATOES 99 c Lb / 2.18 kg.Salerno Mascarpone Cheese 450 g 7.99 ea. Lilydale Oven Roasted Turkey 9. 06 lb /19.99 kg. Ferrante Ricotta Cheese 500 g 4.99 EACH. Salerno Grated Parmesan or Romano Cheese 500 g 7.99 ea. Product of Spain Marc Angelo Tapas 1.75 g 6.99 ea. Product of Italy Marc Angelo Siced Prosciutto 200 g 7.99 EACH. PRODUCT OF CANADA SAN DANIELE PROSCIUTTO 9.99 LB 22.02 KG. GREEN GIANT NIBLETS CORN OR SUMMER PEAS (REGULAR OR 1 LESS SALT) 341 ML - 398 ML 99 C EACH. PRODUCT OF ITALY DELVERDE ONDINE LASAGNA SHEETS 500 G 2.99 EA. CRISSA SPECIALTY PASTA ASSORTED CUTS 500 G 1.99 EA.